But I have to admit (as I've said before): I have a hard time with Shakespeare. Never having studied his work (Maureen, I'm not a theater person) other than reading a few plays in high school, it's hard for me to get into the language and really hear and feel the story. The only theater company that really allows me to do that easily is Ten Thousand Things, who often edits Shakespeare down to a more manageable length and tightened story. But when done in the traditional manner, it's a bit of a struggle for me just to stay present and really focus on what's happening, unless it's a play I'm very familiar with (namely, Hamlet, Romeo and Juliet, and A Midsummer Night's Dream). 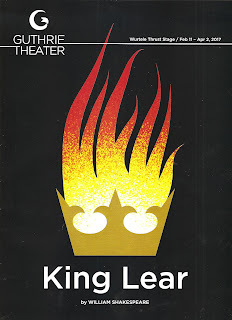 And though I have seen King Lear twice before, it's been a while, so I found myself a bit confused at times about all these characters and their motivations for doing some of the crazy things they did. The story of a leader gone mad, and all kinds of crazy power plays to jockey for the top position, seems unfortunately quite familiar and relevant. It is kind of nice to see the powerful women that Lear's three daughters are, even if two of them take it a bit too far. Kate Nowlin and Sun Mee Chomet are great as the eldest and wickedest daughters, and Kim Wong is the sweet youngest daughter. A couple of local female actors (Shá Cage and Charity Jones) play typically male roles, which is a nice way to even out the gender imbalance found in most of Shakespeare's work. They play the roles as written, dressed like their male costars, and it totally works. More of this please! The cast is nice mix of local faves (like J.C. Cutler, Kris L. Nelson, and James A. Williams) and national talent (like Armin Shimerman as the wise and charming fool, who apparently starred in some sci-fi franchise). There was a bit of an understudy switcheroo the night I attended the show (which may or may not be permanent), and it was really fun to see Jason Rojas not throwing away his shot at the big stage, playing Edgar as a sort of mini-Lear who also goes mad (or pretends too), but then heroically saves his father. Filling in for Jason's usual roles was Nathan Keepers, who's always entertaining to watch, especially when dying a dramatic death. The super cool set includes a dome-like backdrop extending to the Guthrie's high ceiling, and a metal scaffolding that when lowered under the stage provides an exit and entrance on a stairway down, and when raised is a second story perch (scenic design by Marion Williams). 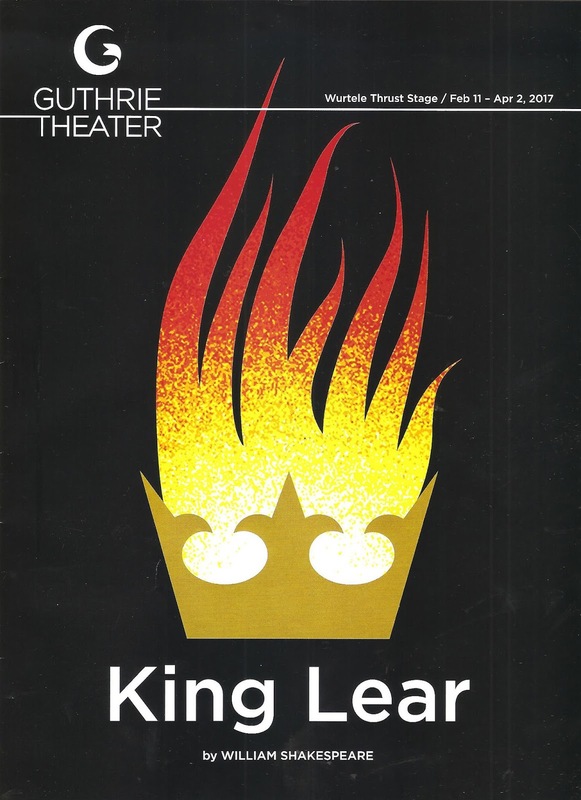 Lighting and sound design (by Jennifer Tipton and Darron L. West, respectively, with music composition by Victor Zupanc) combine to create some truly eerie effects as Lear goes through his many changing moods. Last but not least, the costumes are stunning (designed by Jennifer Moeller). I would place the style somewhere in the early 20th Century, perhaps the '40s, and the women's dresses particularly are to die for. I will now be looking for a drapey slinky open backed dress for the Iveys this year. Finally, as a vegetarian and an animal lover I don't approve of wearing animal fur, except on stage when it looks this rich and lush (and hopefully faux!). To recap - this is a beautiful and top-notch production of one of Shakespeare's greatest plays. But if you're like me, you'll need to work hard to stay present and engaged for the nearly three-hour runtime (and getting up at 5:30 to go to 6 am yoga on the day you see the show is not advised #bloggerproblems). 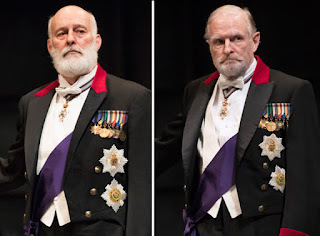 King Lear continues through April 2 on the Guthrie's Thrust Stage.